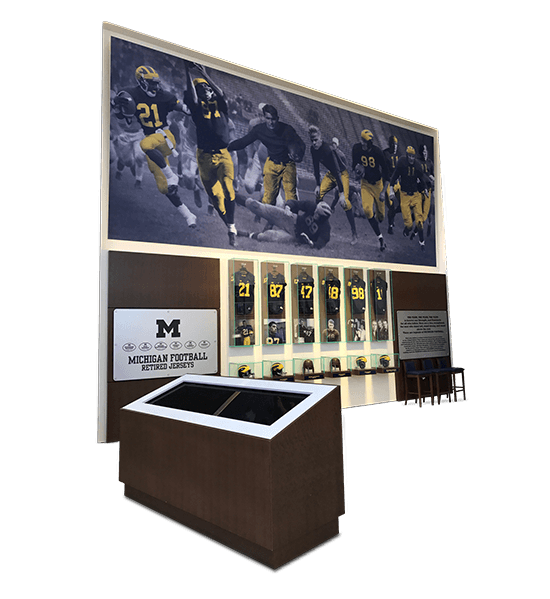 Display case for University of Michigan football memorabilia. If you follow college football, and I mean “The Big House,” you can’t help but think of crisp fall Saturday afternoons in old Ann Arbor town. It’s a local tradition around here to wedge yourself onto a cold bleacher seat between two strangers and join 113,000 fellow fans to cheer on our beloved Michigan Wolverines. A few years back, the Athletic Department built a football museum to honor the true legends of Michigan football. Unfortunately, some rather uninformed individual built all of the display cases out of heavy and fragile glass sheets. They started falling off the walls and shattering into razor sharp shards - as glass tends to do. As fast as you say “Go Blue,” we built 12 replacement display cases from 3030 Green Edge acrylic sheet. It looks just like glass, but it’s eight times as strong and weighs four times less. Also, our workmanship was clearly superior! Another resounding victory for plastic over glass. As often and decisively as we beat glass, you would think they’d take us off their schedule. I guess they’re just gluttons for punishment.